Click on “Delegates” to display the tab. The shared mailbox should appear in the folder list at left shortly. Is that email saying that your online account real or fake? Sometimes it’s pretty easy to figure out. Here’s one that I received today. Whenever I receive something like this with a link on the page, the first thing I do is hover the mouse pointer over it. Doing so in Outlook displays the full web address. 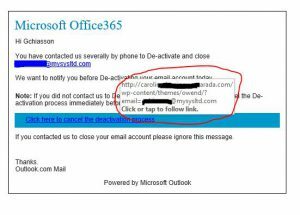 As we can see here that address obviously has nothing to do with Office 365. The “wp-content” part of that even tells us that it’s from a WordPress site that has probably been hacked. Why did someone send this? The easy answer is that they are trying to capture your login information. Sometimes it’s to get at financial information but it can also be to have access to a real email account to perform even more significant fraud. This could include sending invoices to your accounts payable department for payment or sending everyone a virus. What do I do if I think it might be legitimate? If you are concerned that there may be a reason why the service is trying to get in touch with you then the best thing to do is simply go to what you know to be the correct link like https://portal.office.com and if there are real account notifications a good service will inform you when you login. Because of this is that even though you free up an Office 365 license if you delete the user from your on premise server you lose the shared mailbox. Having a bunch of inactive users in your local AD just to keep shared mailboxes is annoying and potentially confusing unless you create a new OU for them. The most common suggestion I’ve seen for being able to delete them is to export the mailbox to a PST using Outlook and then copying the contents back to a newly created shared mailbox with the same name afterwards. During the process of doing some clean up work it occurred to me to try restoring one of these mailboxes from the “Deleted Users” screen. I already had the local PST so if it didn’t work it would be OK. The result was a normal user mailbox with the Status “In Cloud” and assigned a license. Once again I converted this mailbox back to a shared one and removed the license to end up with a Shared mailbox that isn’t associated with an AD user. Step 2 may not be necessary and I’ll update this when I have an opportunity to test. This may be a lucky hack so don’t try this without having your backup first!